CQG Data Factory offers decades of historical data online. Order and download accurate, top-quality data from over 60 exchanges worldwide. Access over 20 years of End Of Day market data and over 7 years of intraday data, including Time & Sales (tick data), intraday bar data, and trade volume. Additional data going back to the 1930s is also available. Call now to place an order. 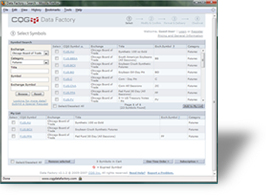 Download FREE samples of various data types to try CQG Data Factory. Available for free when ordered with other data. We offer complete historical data for futures, stock, cash, bonds, and Forex. See a full list of exchanges on the Markets page.